Patricia Martin is a Senior Manager for accounting and finance at CIVIC. 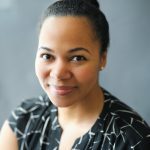 She brings almost 10 years of experience in the non-profit sector and has held positions at the Forum for Youth Investment, The Chesapeake Bay Foundation and Howard University. Her previous responsibilities have included management of finance, human resources and general operation functions. Patricia studied Finance and Marketing at the University of Pittsburgh and received her MBA from the University of Virginia.